Critically acclaimed author and award-winning editor David Fillingim turns his attention to the West—West Georgia that is. This book examines how the contemporary cowboy poetry revival that sprung up in 1985 in Elko, Nevada, has borne fruit in the Peach State. First, Fillingim traces the history of cowboy poetry and its emergence as a cultural phenomenon. 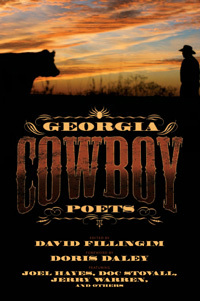 Then he recounts the story of how Georgia became home to a vibrant cowboy poetry scene. But the largest part of the book is an anthology of poems by some of the finest cowboy poets anywhere, and they all happen to be in Georgia.As celebrated cowboy-poet Doris Daley—of Turner Valley, Alberta, Canada—says in the preface, “everywhere is west of somewhere.” So settle in, and travel with Fillingim to someplace west of wherever you are, and enjoy this unique combination of shrewd scholarly analysis and heartwarming cowboy poetry.